I’m not sure when it happened, but at some point Matt and I became totally addicted to cauliflower. Simple, boring cauliflower. We’ve probably roasted a dozen heads of it this winter and every time, we have a hard time getting any onto our dinner plates because we can’t help ourselves from snitching the toasty, browned pieces directly from the baking sheet. In other words, it took a decent amount of restraint to actually get the delicious, caramelized cauliflower into this ravioli. But we did it and it was well worth the short-term sacrifice. And how not? Roasted cauliflower gets combined with creamy ricotta cheese and orange zest, then sandwiched between layers of homemade pasta. Dress it up with brown butter, crushed hazelnuts, and bread crumbs and what’s not to love? I won’t sugar-coat it…homemade ravioli takes time. There’s filling to prep, dough to mix, pasta to roll, and ravioli to form. 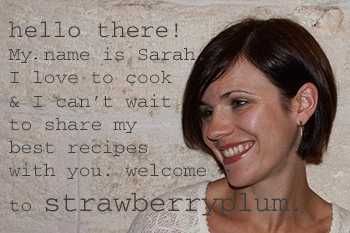 We’ll start with the cauliflower. Break it into small florets and get it into the oven. As you wait for the cauliflower to get the perfect shade of golden, mix up some pasta dough. Flour, eggs, olive oil, water. Knead and let it rest while you turn the cauliflower from special to magical. Roll out sheets of pasta and place a spoonful of the ravioli filling along the bottom side. Fold the top over, press, and cut. Repeat until you are looking at a playful pile of stuffed pasta. Cook the ravioli and sauce ’em up. 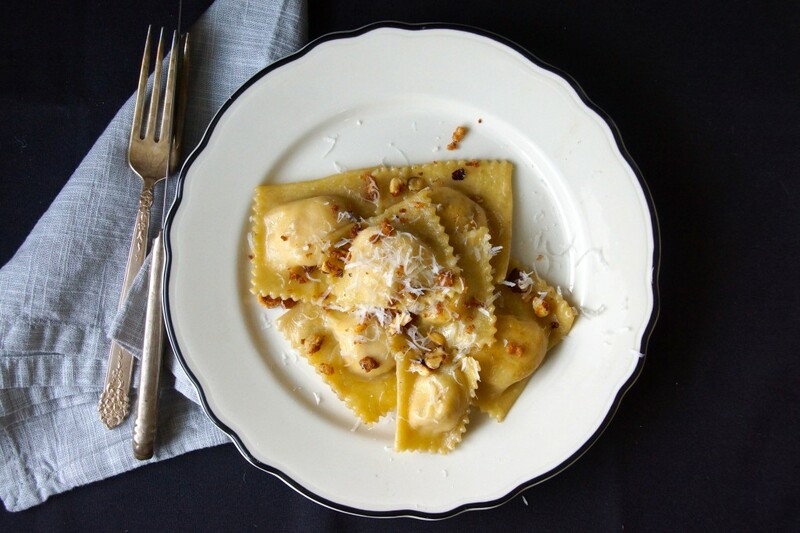 Because ravioli are such a production to make, I take the easy route and dress mine simply: browned butter, a sprinkling of toasted bread crumbs, cracked hazelnuts, and grated Parmesan. Dig in and dig cauliflower. 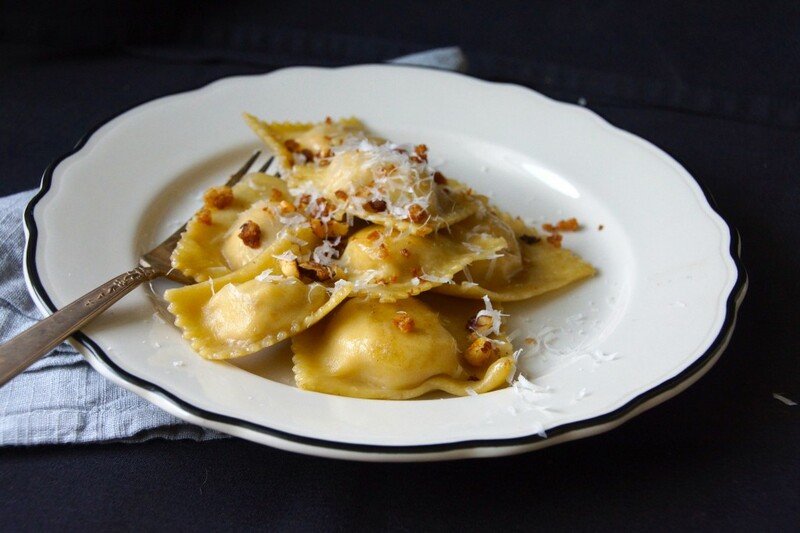 I served my ravioli in brown butter with toasted breadcrumbs, crushed hazelnuts, and Parmesan cheese. Toss cauliflower florets with olive oil and salt. Spread out over a sheet pan and roast until golden and caramelized, about 40 minutes. Stir the cauliflower once or twice while it is roasting to make sure it doesn't stick to the pan. Meanwhile, make the pasta dough. Sift the flour into a large mixing bowl (or directly on a clean counter, but I prefer containing it). Make a well in the center of the flour. In a small bowl, whisk together olive oil, eggs, and water. Pour the wet ingredients into the well and use a fork to incorporate the wet ingredients into the dry. When a scraggly ball has formed, remove the dough from the bowl, transfer to a lightly floured countertop, and knead until the dough is smooth and elastic, 1-2 minutes. Wrap tightly with plastic wrap and allow to rest for at least a half hour while you prep the ravioli filling. 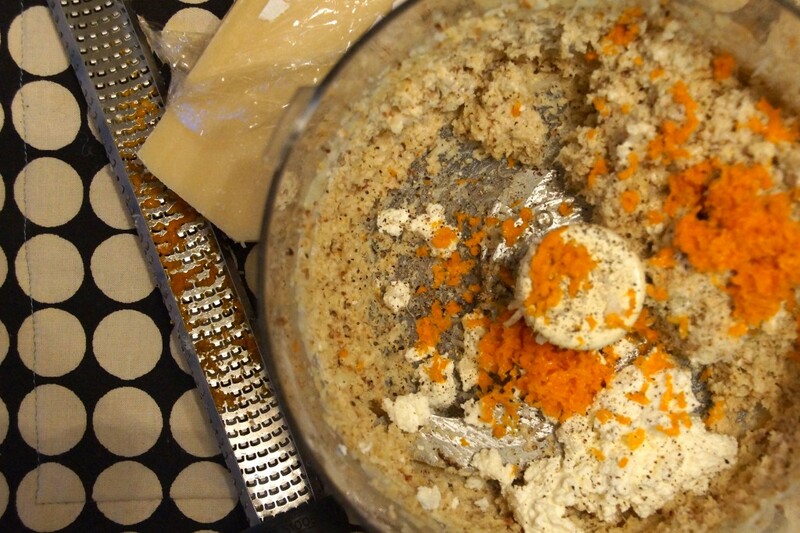 Combine the roasted cauliflower with ricotta, parmesan, and the orange zest in the bowl of a food processor. Process until fairly smooth, about 1 minute. Season with salt and pepper, as necessary, and set aside. Divide the pasta dough in 6 or 8 pieces and run through a pasta roller, getting it as thin as possible (try to make it to the thinnest setting). 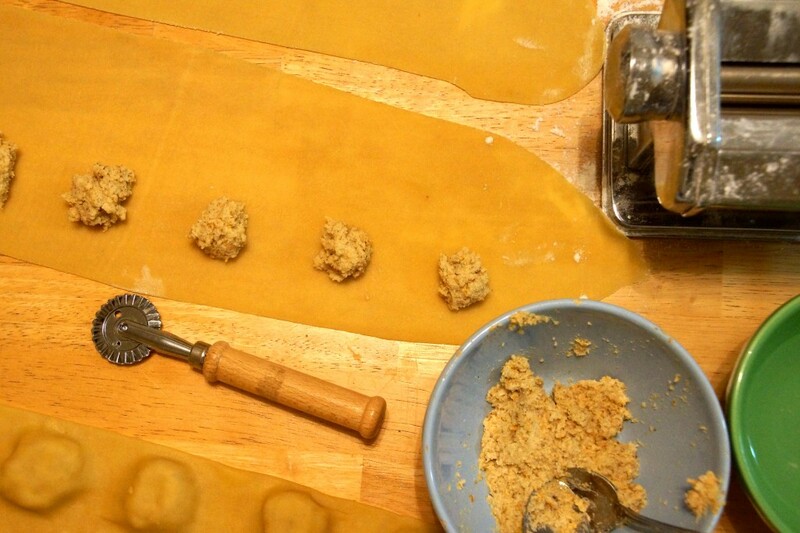 Once you've rolled all the pasta dough into long rectangular sheets, lay them out, and place about a teaspoon of the filling every 2 inches along the bottom half of the pasta sheet. Wet your index finger and outline a square around each mound of filling. Fold the top half of the pasta sheet over the filling and press to seal. 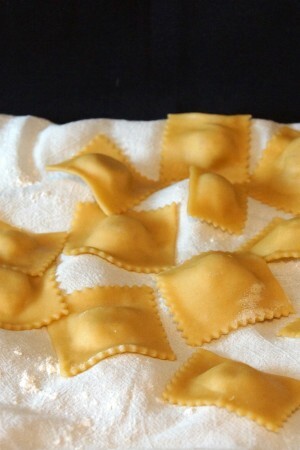 Cut into squares and place on a lightly floured towel until you are ready to boil the ravioli. Cook the ravioli in salted boiling water until it rises to the top, about 2 minutes. I cook the ravioli in several batches so they have plenty of room and the temperature of the water doesn't fall too much. 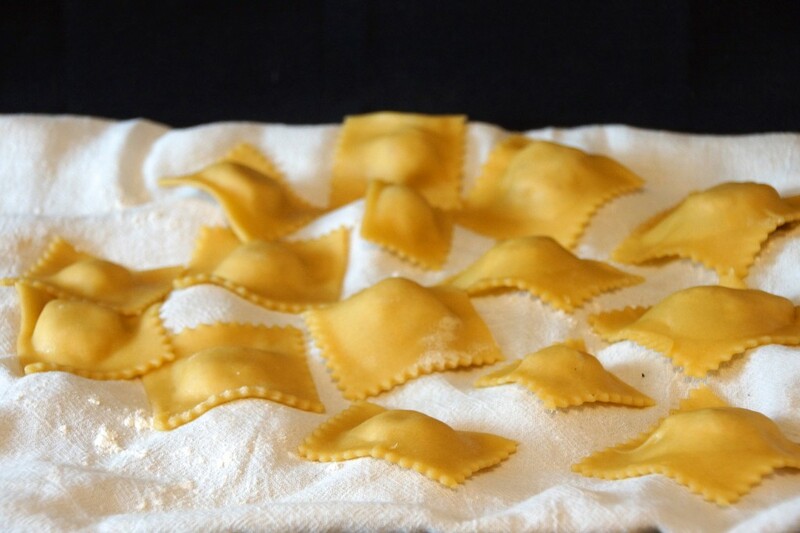 If serving with brown butter, transfer the ravioli directly to the pan containing the butter along with a little of the starchy pasta water to help bind the sauce to the pasta. Garnish with toasted (fresh, homemade, preferably) breadcrumbs, chopped hazelnuts, and Parmesan cheese. This is a ‘work of art’ dish 🙂 Looks and sounds delicious!